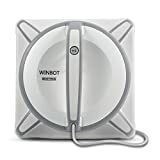 If you hate cleaning windows or just find spraying them and wiping them down in seconds entirely too laborious, then check out this cool new WinBot - Window Washing Robot. It's the 21st century, so of course there's now a little cleaning bot that clings to windows and glass and autonomously cleans and dries them for you. Just spray some cleaner on the washable and reusable cleaning pad, switch on the internal vacuum pump to keep it suctioned to a window, and let it go to work. 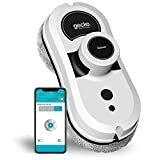 It first maps out an optimal and efficient cleaning path that automatically avoids frames and sills, then its front microfiber cleaning pad removes dirt, grime, and smudges as it traverses around, while an undermounted squeegee channels excess moisture to a rear pad that dries and wipes away streaks. Then repeat on each window until you're exhausted from watching it do all this hard work for you. Sure it's kind of overkill for a single window or a bathroom mirror, but if your home has a ton of windows, especially tall ones or ones that are high up, it could be a handy, time-saving solution.